I've always been a big fan of Fizik's saddles having ridden various iterations of Ariones and Aliantes but I'd happily say this Kurve Snake Aluminium is the best so far. Performance and comfort in equal measures. The Kurve saddles are a separate range in Fizik's line up containing three models, the Snake, Chameleon and Bull which embody their Spine concept. If you haven't come across before, this it is based on your flexibility; the shapes are designed to reflect where your bodyweight is positioned. The Snake that we have here is the the Kurve equivalent of the Arione and is for the most flexible at the lower back. It's shaped to support the rider's weight mostly on the sit bones rather than the genital area. The flat profile works well allowing you to position yourself wherever in relation to where your hands are on the bars. Even in the racing tuck I didn't feel any pressure and that's on a bike with a saddle to drops depth of 240mm. A lot of the comfort is provided by the main body, or lack of it. It's a composite construction including Kevlar which means its very light and strong. Strong enough in fact that it can have large sections removed at the sit bones and perineum areas. As you pedal the whole saddle flexes, intensified in these areas which means the saddle is moving with you reducing any pressure points or hot spots. It's minimal though as the seat still feels stiff, in fact you can't feel anything at all even from the first ride the saddle just feels right. There is very minimal padding between the shell and the elastic cover but it's all you need. Up at the nose end you get a choice of 'tuner' as Fizik call it. This is a plastic spacer that forms part of the overall structure bolting to the saddle around the rails. 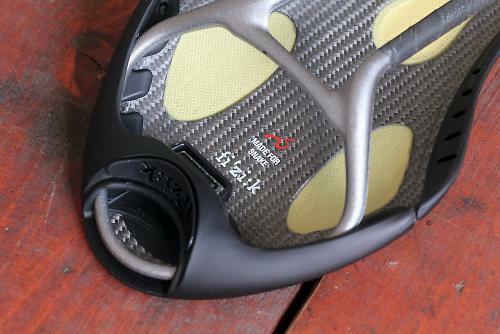 The two options - soft and hard - change the tension in the saddle body. 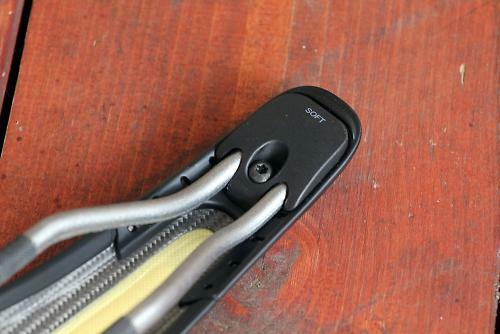 The hard option makes the top stiff, while the soft gives you a couple of mm of movement when your weight's fully on it. It was this one I preferred as the little bit of movement just took the edge off rough road surfaces. Fizik even provide a little mini tool to change them over. You also get the WingFlex feature that has been on saddles like the Arione for years where the side of the saddle flexes under pressure from the thighs during pedalling. Again it's subtle but on longer rides you do notice the difference. Aluminium seems an odd choice for the rails on a top end saddle with most using titanium for a bit of comfort. When you look at the design of what Fizik call their Mobius rails you'll see that the one-piece loop provides structural rigidity to support the flexible saddle base. The tubular design is made from 2014 grade alloy hardened to T6. Unlike most saddles where the separate rails plug into the saddle either side this runs right around the outer rim with a strengthening bar across the rear. There is a carbon-railed version if the 220g alloy saddle is a little too heavy for you. Overall the Kurve Snake is a brilliant option for racers and offers loads of comfort while being light and stiff. You don't want to be wasting power through a flexible saddle body and the Kurve just acts more like a gentle shock absorber allowing you to put the watts out without compromise. At 295mm its 5mm shorter than the Arione (which changed the rules when it came to saddle length) but it still gives you that length if you are a rider that likes to slide back for climbing. The only sticking point is the price really. £189.99 is a lot of money for a saddle but this obviously comes down to your budget and the type of bike it's going on. 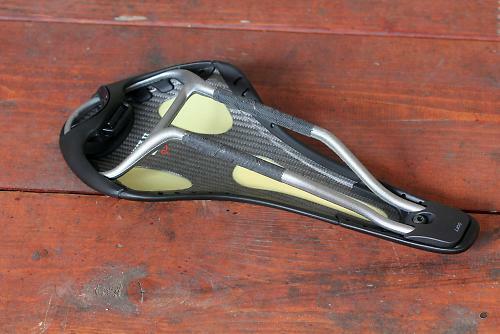 Interesting design that creates the comfiest race saddle I've tried; it'll cost you though. The Kurve is a separate range of saddles due to its differing design to the rest of the line up but in its Snake guise I'd say its up there on performance with the Arione but providing more comfort. Really well put together, no seams, staples or glue in sight. Saddles vary loads between individuals but for me it was the most comfortable race saddle I've used. In fact it's probably the most comfy saddle, full stop. I can't see any issues arising anywhere really as there is very little to go wrong. Not the lightest at this price point thanks to the continuous rail but I'd take the weight penalty for the comfort. As you can probably guess by now I really rate it. The shape and amount of flex in the saddle really suited me. It's about forty quid more than I'd want to spend. Would you consider buying the product? Yes, especially if I could find a bit of a discount. For me the Kurve is nearly the perfect saddle; the comfort is spot on and the shape really suited. It is on the pricey side though I do appreciate it is handmade and the weight is about 50-80g higher than others in this price bracket. I'd sacrifice that though for the comfort. It isn't perfect but its pretty close. Dread to think how much the carbo rail ones are , but can't be bothered googling it. Arses for courses I guess. I tried the Kurve Snake when I was going through a bit of a saddle crisis a year or two back but I found it really uncomfortable. It caused some nerve pain down my left leg. I went through most of the Fiziks and a Spesh or two but ended up with a Selle Italia SLR, which my backside is still in love with. If only you could try any saddle before you buy...I was quite determined to find a Fizik that worked for me cos that was the only brand that offered test saddles. It took weeks of discomfort before I finally found the one for me. I tried two different Fizik saddles this summer and was not happy with comfort levels at all. The top of the seat is just too curved and the 'plastiky' finish too slippery for my liking. Ended up buying a much cheaper 'Concept EX' saddle with which I'm totally satisfied. these saddles are very comfortable. I'm using the alliante"VS" the kurve bull, a romin 143 and a brooks imperial standard. I had a saddle crisis about 2 years ago, and have "figured it out"
any of the above saddles work well for me. The Fizik Kurve bull is the most "intersting" and very well designed. I still feel the Alliante VS. with the channel is better. I've never "forgotten" about the saddle on long rides as much as with the Alliante VS.
Of course, the Brooks Imperial standard is finally broken in. I'd be lying if I said there was ever a saddle more comfortable than my Brooks. Shame it took me over 20 years to "cave" and buy one! it's fantastic on a bike with significant drop, and on a flat bar road bike in a more upright position. Very versatile. the alliante VS was "okay" on that bike. The kurve bull was "hard"
I've tried several Fizik models, and have yet to find one I was 100% happy with. The Arrione in particular is a saddle that takes a long time to get the position right on, in my experience anyway. I've often wondered if the unusual length of it is part of the problem, coupled with a significant gradient from back to front that makes both position and angle hard to get right. I've personally never understood the almost cult following the Arrione has. It's some odd hybrid of TT and road saddle. I've since moved to Selle Italia's SLR Kit Carbonio, which has the least padding of any saddle I've seen, save for the pure carbon models. Bizarrely I have found it infinitely more comfortable than the Fizik models I've tried. Like all things saddles though, what works for me doesn't necessarily work for anyone else!